Minnesota is beautiful and weird and now it has a book to prove it! 5 Stars! Hail Minnesota for its strange sites, bizarre history, and peculiar folks! Come along and climb the Witch's Tower, sit down in a two-story outhouse, and spend a night in the Drunk Tank at the JailHouse Historic Inn. Then go gape at the country's largest collection of underwear. After all that, relax at the Bowling Hall of Fame. This new paperback version of Weird Minnesota is a wild and wacky trip you'll never forget. I've lived in Minnesota twice now. Once I lived in Duluth and then I lived in Minneapolis. I preferred Duluth, which is prettier and has more to do for those interested in the outdoors. The people up North are nicer too. Minnesota is a weird place and now it has a book to prove it. If you enjoy traveling to different places, either by car, plane or via armchair, and like the unusual, then this is a book for you. 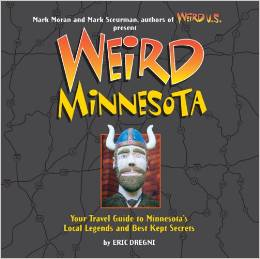 Learn all about the weird in Minnesota and not just about the people. Some stories aren't weird, just not common. All in all, an interesting read. Full of photos.